It appears that a significant part of what I have written for the past day has been wrong, and the information that I, in good faith, commented on to several radio stations and newspapers about the status of the Gulf leak was similarly not totally correct. The company announced late in the day that it had suspended shooting heavy drilling mud into the blown-out well 5,000 feet underwater around midnight Wednesday so it could bring in more materials. Thursday evening, BP PLC said it had resumed the pumping procedure known as a top kill. Officials said it could be late Friday or the weekend before the company knows if it has cut off the oil that has been flowing for five weeks. The conclusions that I drew about the pressure drop up through UPDATE 8 on Wednesday, when we were losing visual contact with the leak, because of what I thought was mud falling around the well could have been correct. However, later comments on the relative flow velocity were based in part on the assumption the BP was still pumping mud. They were not. So that while the velocity observation was correct (since BP has stopped pumping) that is the only consolation I have from believing the Admiral’s statement this morning that there was only a slight problem with pressure balance before the company could start pumping cement into the well. (The LA story that I took this from has been updated so I cannot go back to the original quote). As I say this is more than mildly irritating, and I will try and be more cautious in drawing conclusions in the future. It does, however, through the pictures I posted, allow us now to be able to identify the difference between the mud flow (top picture) and the oil/gas flows that are in the remainder, with very little, if any, mud. (and at 8:40 pm on Thursday it is still oil and gas). 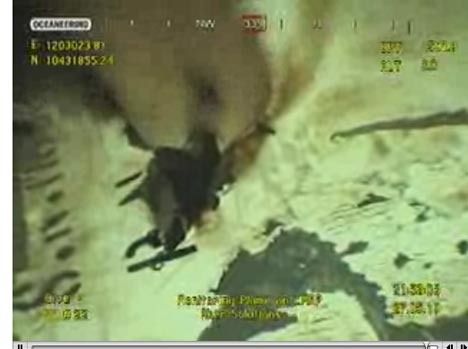 Although incident commander Adm. Thad Allen of the U.S. Coast Guard said Thursday morning that BP had temporarily stopped the flow of oil, the company's chief operating officer later said petroleum was still flowing. "Once the well has stopped flowing then we would pump cement down into the hole to fully seal it," Doug Suttles said. "We might finish this in the next 24 hours, or it might take longer." Engineers next plan to inject heavier "bridging material" above the mud to prepare to put a cement seal on the well. Well I see that the monitoring ROV is back in position to watch the leaks as BP, perhaps, is about to restart pumping mud – if they really are. I would stop commenting on this, but sadly it is too important a subject not to continue. My apologies if I have, inadvertently misled you. Piece of "junk" (?) in the riser crack, as BP apparently work to reduce the size of the path through the BOP. UPDATE 2: Mud is clearly visible in the change in the look of the flows out of the riser. But at the moment it does not appear to be under the pressure of the flows on Wednesday. (This could be because it is being pumped in at a lower pressure, or it could be that they have sealed some of the leaks in the BOP and that is cutting back the driving pressure at the riser). The problem we saw on Wednesday night with mud being heavier than oil and thus settling more readily and obscuring the view, is also evident. UPDATE 3: 12:18 AM So it appears that BP have injected "rubber strips" into the flow, and that some of these have lodged in the BOP, reducing the flow channel, while one made it through and is trapped in one of the leaks in the bent portion of the riser. Now what may happen is that they will slowly increase the mud flow/pressure to a) find out how much the leak rate has been reduced and b) to make sure that the restrictions in the flow channel are stable, and won't blow out. (If they do then they will have to repeat the process). Once they have a sure reduction in leakage then they will re-generate the higher pressures that overcome the pressure in the reservoir and start forcing the oil and gas back down the well, as the mud begins to fill the pipe. The mud seems to have a slightly different texture from last time, so they could have increased the mud weight so that when the column of mud is re-established that this time it weighs a little more and overcomes the slight pressure imbalance that they were left with the first time they tried this. Now is a good time for caution and, though the fill time may be reduced because of the smaller leak rate into the Gulf, they may still pump at a relatively only slightly higher pressure that that in the reservoir, to slowly sweep down the well, getting into the necessary channels, and giving time for the oil and gas to be pressed back into the rock that it came from. Hayward told CNN BP engineers had injected a "junk shot" of heavier blocking materials into the failed blowout preventer of the ruptured wellhead, and would also pump in more drilling "mud"- all part of the top kill procedure being attempted. "We have some indications of partial bridging which is good news," he said. "I think it's probably 48 hours before we have a conclusive view," he added. Admiral Allen also noted at that time that the leak had been stopped, but that they were not sure that they could sustain the halt in flow. However at 8:10 am, Sterling925 who wa watching and commenting on The Oil Drum saw some sort of event occur around the BOP. Chaotic images - looks like an explosion! 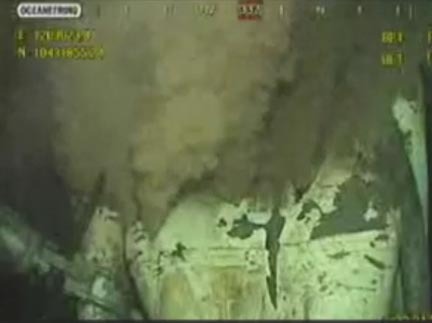 It looks like A LOT of gas is coming up from the seabed around the BOP. Considering the large water pressure and the possibly large area this gas is emanating from it ought to be a large flow. This indicate the integrity of the well is not good? Unfortunately I did not see any of this and haven't been able to see the BOP apart from one short short since, though in that shot it did not appear to have any problem. The PBS viewed ROV at the moment is working with a chain, while the ROV that was monitoring the plume is now staring out into the ocean. The CNN shot however shows that we are back with oil and gas apparently coming out of the leaks at the top of the riser, and no different to the conditions before they started pumping mud into the well last evening. So the second filling of the well has apparently all been washed out, and they will try again later. The comment from BP was that this might take another couple of days. UPDATE 5: 10:24 AM Well I am not sure that the CNN feed was actually live and there are other stories catching their attention at the moment, but there is a Youtube recording of what took place (h/t Jessica in Pensacola). UPDATE 6: 11:09 AM The feed has gone back to the riser, and we are back to the oil and gas flows that we were saw at the beginning. Not quite the same shapes as earlier, so perhaps the block in the BOP was partially effective, but BP have now apparently filled the well twice and failed to get enough weight into the mud to hold the driving pressure from the rock. They could try again with a higher density mud, I am presuming that the second shot had a higher weight than the first, and that while the first left a small pressure imbalance, that the second was closer, but as yet no banana. (Though the Admiral did say that they had stabilized the flow). My presumption is that they will mix up another batch and try again - though whether they will try another junk shot is not clear. The way in which you try and stop leaks is that you put the big stuff in first. If you can get enough of that to stick, it still leaves large flow channels, and so the second shot uses smaller pieces that fit into the gaps. Then you try smaller shots etc until you get as good a seal as you can. Doing this to plug water flows into tunnels can take several shots to get a total seal, working with sequentially smaller sizes of particles. "I would stop commenting on this, but sadly it is too important a subject not to continue." Please don't stop, HO. You are doing a great job of keeping the rest of us up to speed on what is happening, 'warts and all'. This is about the only place I know where there is a summary of real information by someone with a technical background trying to make sense of the physics. 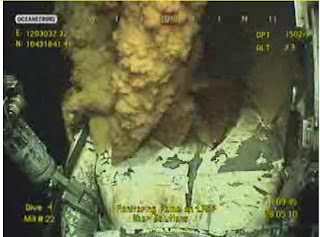 Yes, BP's failure to keep everyone up to date with what they are doing is inexplicable. Maybe that is part of the same company attitude which helped create the blowout in the first place. But please, persevere. We need you! Pure speculation -- part of the challenge with the top kill may be a complicated flow path within the well. Perhaps the flow from the reservoir is on the outside of the production string, coming up the annulus. It looks as if the top riser leak expanded under pressure to allow a spew of junk and gas (partially as hydrates) to escape. No need to apologize HO! Your site is the best I've seen for sane information and analysis on this horrible disaster. You are providing knowledge whil it seems everyone else is trying to may hay with spin. I appreciate your writing a great deal. I'm not sure BP is doing a very good of a job providing clear info (understandable to some degree), but you actually have taken the time to wade through the deeply technical information that is available and provide us laypeople a solid understanding of the situations and challenges. Please keep going on this great work! this is valuable, I look forward to more. maybe the next generation bop would have a valve in it similar to a fire hydrant?